There he was . . . Oh my God its Mel Sembler. . . I couldnt believe it. My eyes focused, and I realized there was the main dude responsible for all this crap standing 30 feet from us. I yelled out there he is!! The rest joined in. Mel would not validate our existence by looking at us. He was keenly aware of the group confronting him. It was a very tense and exhilarating moment. The tension was palpable. We made a difference to the status quo. We rocked their world and made them think. We were the topic of discussion in the grand Holocaust party. Comments of one of the protesters. 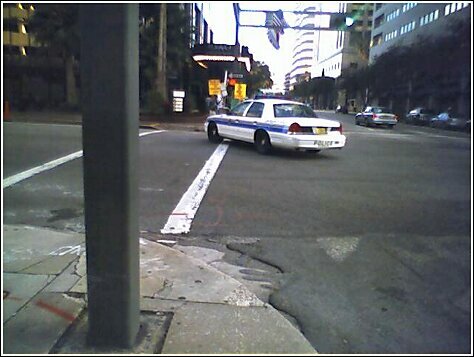 On January 17, 2004 at 7PM the Florida Holocaust Museum had its 4th Annual "To Life Awards" Banquet in the Hyatt Regency in downtown Tampa, Florida. Honored guests included actor John Voight and World Heavyweight boxing champion Evander Holyfield. But at 4:30PM a crowd assembled outside the Hyatt to protest the event. Why would anyone want to protest a function sponsored by the Florida Holocaust Museum! Well the protesters know about the great Straight Holocaust and the people responsible for it. They know about Straight's grand-scale violation of human rights and civil liberties of thousands of American teenagers. 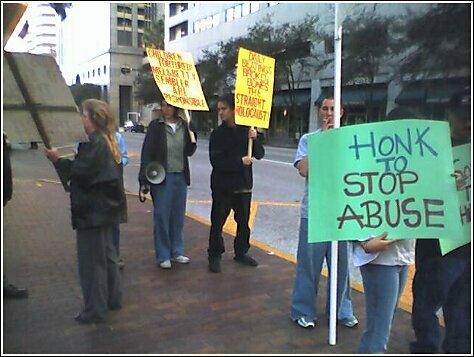 The protesters were protesting the fact that the Florida Holocaust Museum was founded by Walter Lobenberg who happens to be former president of Straight Foundation and who continues to be on the board of Straight under its current name--the Drug Free America Foundation. The protesters' grievance is documented in their flier/press release here. Last summer Reverend Doctor Miller Newton, Straight's former national clinical director, settled with former client Lulu Corter for $6.5 million for the abuse he directed to be inflicted on her at his second-generation Straight--KIDS of New Jersey. That story is here. Besides Mr. Loebenberg, the Florida Holocaust Museum recently named Dr. Bruce Epstein as an interim director. Dr. Epstein is a former Straight board member himself. 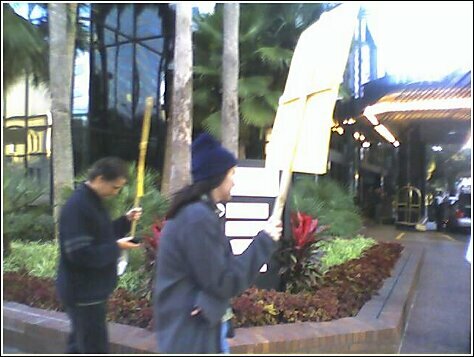 Worse yet, from the point of view of the protesters, Straight founders Mel and Betty Sembler are (or have been) Florida Holocaust board members. The protesters say they want the Florida Holocaust Museum to sever all associations with anyone connected to Straight. The SS called Dachau a "re-education centre", Straight calls its camps "re-acculturation centers"
The Communist Chinese call their camps for political prisoners "Seventh of May Academies" or "re-education" centers. Straight calls its indoctrination camps "re-acculturation" centers. Truthfullness and Honesty are flaunted to the point that kids often have to lie to avoid punishment. Some Straight kids without drug or alcohol problems are abused in the name of Sobriety. Straight is a five phase program, but, paradoxically, when one graduates he doesn't progress to Sixth Step, he graduates to Seventh Step perhaps in reference to Chinese Seventh of May Academies. Cops show up at 1707 and give the protesters the green light. Reason for the protest. The protesters' flier/press release is here. A detailed description of the protesters' grievence is here. Additional photos taken by photo cell phone will be posted as they are transmitted to us. link. Unauthorized Biography of Straight Founder Ambassador Melvin Sembler. The New Jersey Law Journal labels the Straight method medical quackery.